Amazon parrots are among the breeds that are more likely to learn to talk. Yet the appeal of having a talking pet continues to drive parrot ownership to the point where they’re now the third-most popular pet in America. Millions of owners search the Internet to learn how to teach a parrot to talk. Videos and instructional books are everywhere. There are even audiotapes and other tools that are supposed to help you teach your budgie to say “who’s a pretty bird.” But every expert agrees: Never buy a bird just because you want to show off a talking genius to your friends and family. 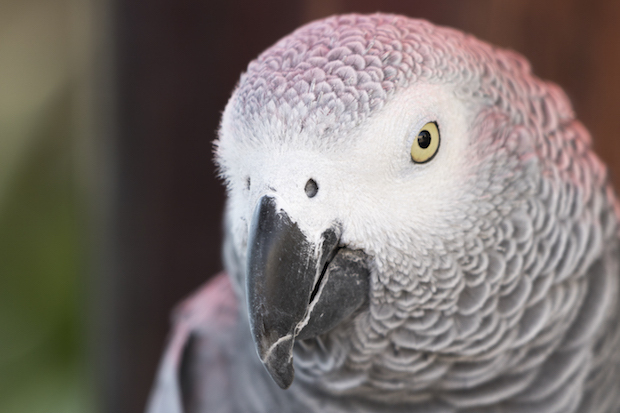 IDA notes that along with their #3 status in pet popularity, parrots are also some of the most misunderstood pets – and therefore among the most discarded pets in America. Before excitedly putting down your credit card at the pet store for your new feathered friend, it’s critical to research the details of owning a parrot. Once you have a solid grasp of what it’s like to be a parrot parent, only then should you start to learn how to teach a parrot to talk. And the first thing you need to learn is how and why parrots talk. Understanding this will make your efforts to teach Polly to ask for a cracker much more effective. All parrots “talk.” They’re highly intelligent, social animals, and in the wild, they developed complex calls and sounds that allow them to communicate with each other. According to Slate.com’s The Explainer, research suggests parrots use their vocalizations to tell members of their group apart from members of rival groups. Birds seem more likely to respond to calls that are familiar to their own, and they shun individuals that don’t speak their language, as it were. In turn, because they’re social enough to enjoy being with their owners, it’s believed that they learn to mimic human speech in order to communicate as they would with their flock in the wild. And while they don’t have vocal cords or flexible mouths, their vocalization equipment does allow them to create a wide variety of sounds – and they’re intelligent enough to learn how to put these together in a way that their human “flock” will understand. Some types of parrots and related birds are more likely to learn to talk than others. PetMD.com created a top 10 list of birds that can talk based on the affinity of each type for talking, and the ability to speak so that humans can understand them. This is why, though some experts encourage the use of CDs to help train a parrot to talk, others point out that such things don’t work nearly as well as using your own voice and interaction with the parrot. So the first step is to bond with your bird and get to know what he likes to do. Make sure he’s comfortable and relaxed, and doesn’t shy away or try to hide from you. If he’s often nervous, move his cage to a less busy part of the house. 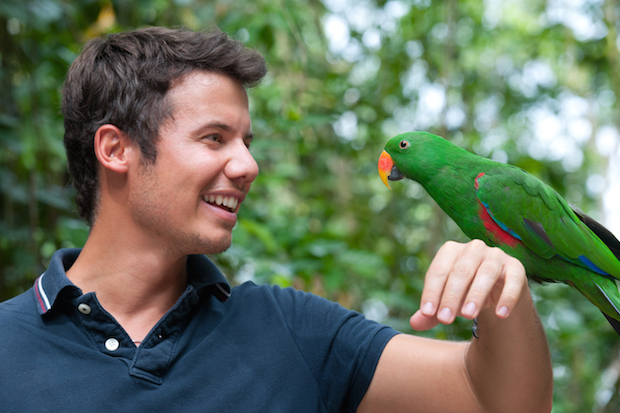 Knowing how to teach a parrot to talk means making sure he’s relaxed and happy to be with you. As you bond with your parrot, include frequent social interaction with him so he’ll start to think of you as his mate and will want to communicate with you in the words you teach him. Most important are activities he enjoys, such as eating and playing with toys. Holding your parrot in front of your face is a good way to teach her to talk. Start off with a few short words, including his name, and always use a positive tone. You’ll probably start to notice him paying closer attention to certain words, so repeat the word or phrase as often as possible, with a slight hesitation between each repetition. Hold the bird perched on your hand or finger about 12 inches from your mouth, or work while he’s perched on a tee stand. Stick to a routine so your parrot becomes accustomed to working with you at a specific time of day; mornings and evenings tend to be when a parrot’s powers of concentration and absorption are greatest. And keep in mind that changes in a parrot’s routine can upset him and interfere with learning, or even cause him to regress. Your parrot won’t start to speak immediately, and when he does, you may not even recognize the words at first. Just be patient! On the other hand, if your parrot stopped talking after learning how to do it, you should always check with your vet to find out if a medical issue is causing the silence. Above all, remember that not all birds will ever decide to speak – and that’s OK. It doesn’t mean your parrot isn’t as intelligent as others. And the time you spent trying to teach him to speak is all about bonding, which results in an even more loving companion! And of course, any time you have questions about your parrot, you can always get fast, professional assistance from the avian Experts on JustAnswer.com. You won’t have to transport your bird to the vet, and you can get help at any time, day or night. Do you know how to teach a parrot to talk? If we’ve missed something, please share with us in the comments below!